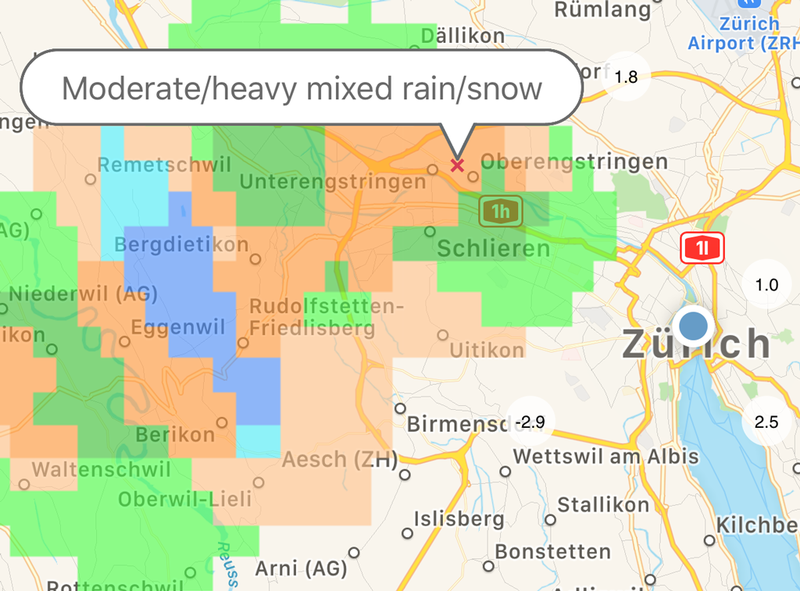 The weather analysis LiveHD is a radar-based map product which updates every 5 minutes the significant weather known from the model maps as analysis, i. not as a forecast, spends. Base is the radar image of the last appointment. It can be seen from the colors of the precipitation phase, i. whether it is rain (greens), sleet (orange), snow (blue) or ice (red). In the objectified decision of the precipitation phase u.a. Measured value based SuperHD model analysis. In addition, there are still fog (yellows) and thunderstorms (pink), also based on real readings. The reliability of this derived product is i.a. depending on the topicality, quality and density of the measured values, as well as the radar image itself. Deviations from reality can arise in isolated cases with freezing drizzle or by too low radar returns in mountainous areas.